I don’t buy them often because of the expense and the waste they create, but I do like Lysol and Clorox wipes for the convenience. 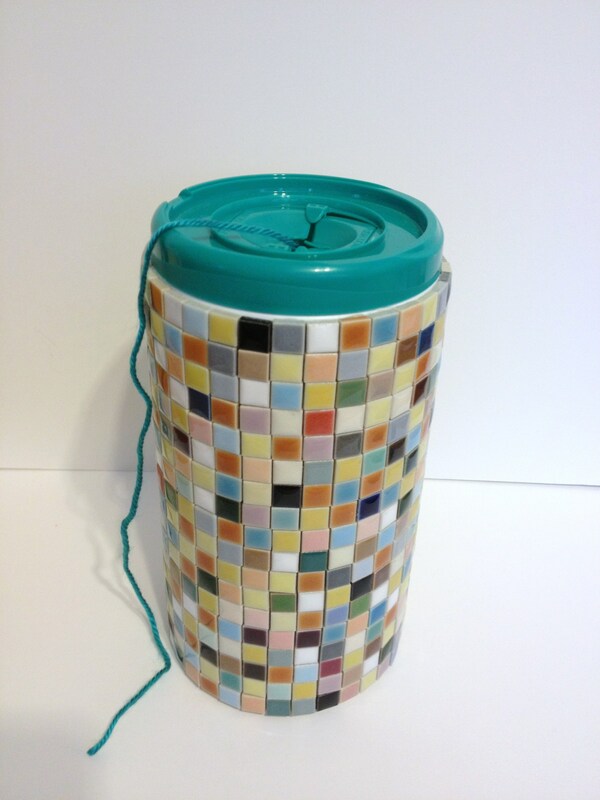 This weekend I turned one of the empty plastic containers into a pretty and handy yarn container! One of the great things about this is that the weight of the ceramic tiles weigh the container down so it won’t get knocked over as your pulling your yarn. All I did was glue 1/4″ ceramic tiles (which I purchased off ebay, but also available at Michael’s store). I used Tacky Glue (my favorite) and just worked section by section. 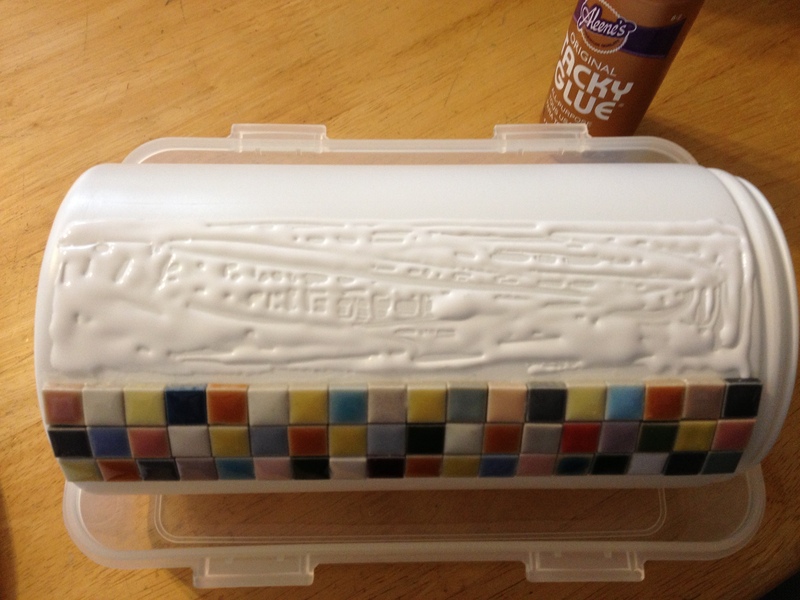 After I applied a layer of glue, I waited a few minutes before starting to add the tiles so that the glue could get nice and tacky. The hardest part is getting the round container to not roll. My trick? Find a box or container that you can fit your container in snug so that it won’t roll: Then work in small sections, allowing the glue to dry well before moving to the next section. 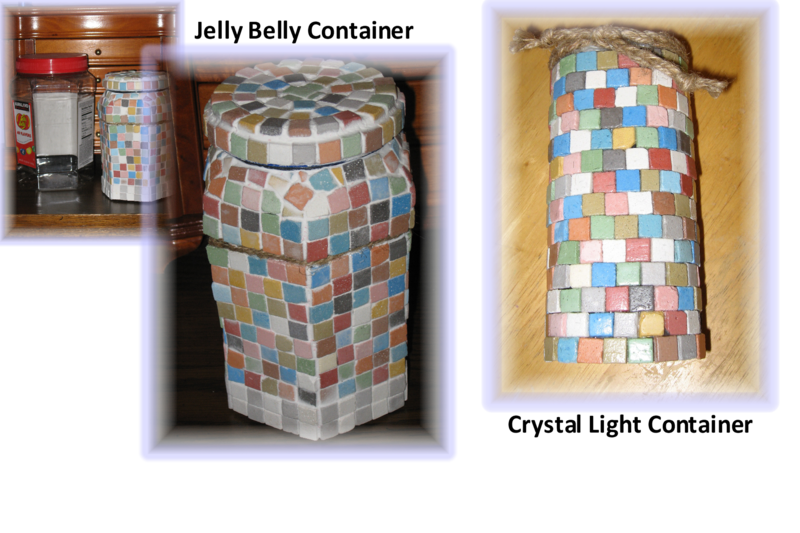 I enjoy working with these little mosaic squares and up-cycling various containers that would otherwise go to waste. It’s a great mindless activity to pass the time when you just want to take a break from other things. I often have one of these projects going on my kitchen table. Below are just a couple others I have made out of Jelly Belly jelly bean containers and Crystal Light containers. 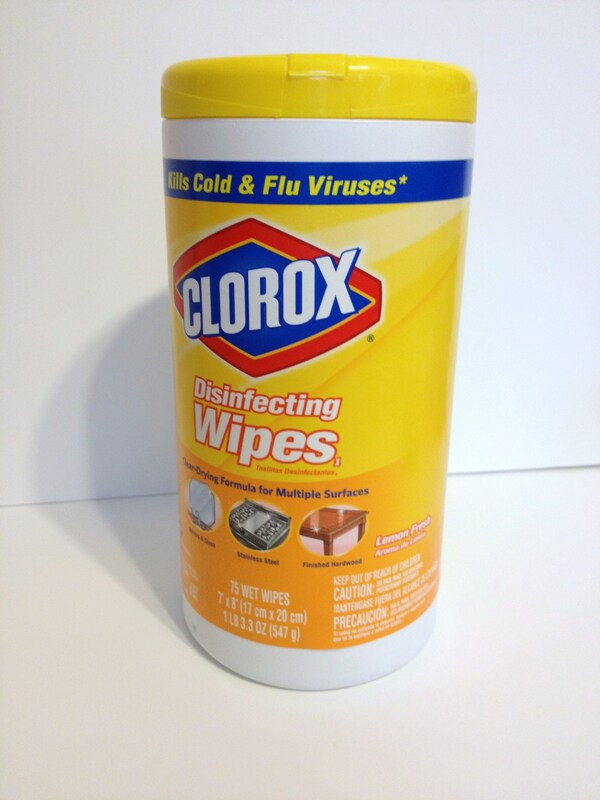 One additional note on the Clorox and Lysol containers. I always find I have cleaner left in the bottom of these, so I maximize the use by grabbing some paper towels and tossing them in the empty container. They absorb the leftover cleaner and are ready to grab when I need them. There are also many recipes on the internet more making your own cleaning wipes. This entry was posted in Crochet, General Crafts and tagged clorox wipes, lysol wipes, mosaic, Tacky Glue, yarn bag, yarn bowl, yarn container. Hi I found your blog at Crochet Addict CFS. You are one talented crocheter! My dream is my pattern to be featured in a crochet magazine.